These are much wanted but not, of course, to be grown outdoors hereabouts. But indoors, in pots, with warm-weather rotation to outdoors, things can be done (as the length of the “other links” list farther below shows). Most citrus adapt well to container growing, and the more acid types—such as lemons and limes—do particularly well. In practical culinary terms, the priority order (these things do want a pretty sizeable pot, so much depends on the space you have available in front of south-facing windows) would probably be lemons, limes, and kumquats. Lemons and limes you doubtless know well; kumquats are small fruit, scarcely over large grape size, that you eat out of hand, skin and all; they have a characteristically citrus taste, something approximately along the orange-tangerine line. Kumquats would be well down the line in priority after lemons and limes, but if you have a lot of window space…. The sweeter types of citrus (such as oranges and tangerines) need a lot of heat to ripen, whereas the more acid citrus (such as lemons and limes) need much less, and so are more easily grown indoors. The acidic types not only ripen their fruit much faster, but also tend to be nearly ever-blooming. Here are some growing tips for indoor containerized citrus. 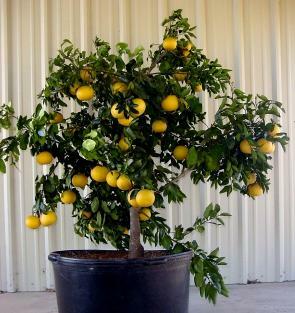 Citrus is very adaptable to container growing in anything 5 gallons or larger. As long as you start out with a well-drained potting soil, you likely can keep a citrus tree in the same pot without root pruning and repotting for many years. Use a potting mix comprised of 1/2 redwood sawdust, 1/4 sand, and 1/4 composted yard waste, and incorporate a slow-release fertilizer specific to citrus plants. If you haven’t got compost to hand, try aged steer manure. Do not withhold fertilizer—including nitrogen—as the winter season approaches, as was once mistakenly believed advisable: it does not help harden the plants up in preparation for cold weather. During the winter, when soil temperatures are cooler—even indoors—slow-release fertilizers for container-grown plants tend to be ineffective, so it’s advisable to supplement them with a liquid such as Miracid or fish emulsion. Re-wet dry citrus rootballs by placing a few drops of mild dishwashing soap directly onto the soil, then water with slightly warm water. If you have aphids or spider mites or the like, get some Neem oil-based spray and spray every part of the leaves: over, under, and around—don’t miss any spots. But it works a treat. Citrus is a genus of flowering plants in the family Rutaceae, which originated in tropical and subtropical southeast Asia. Citrus plants are large shrubs or small trees, reaching from 15 feet up to 50 feet in height; they have spiny shoots and alternately arranged evergreen leaves with an entire margin. Their flowers are solitary or in small corymbs, each flower roughly an inch diameter, with five (or, rarely, four) white petals and numerous stamens; they are usually quite strongly scented. The fruit is a “hesperidium”, a specialised berry, globose to elongated, with a leathery rind surrounding segments, or “liths”, filled with pulp vesicles. Citrus fruits are notable for their fragrance, which derives from flavonoids and limonoids (which, in turn, are terpenes) contained in the rind; most are quite juice-laden. The juice contains a high quantity of citric acid, giving them their characteristic tangy flavor, and making them good sources of vitamin C and flavonoids. The taxonomy of the genus is complex, with the precise number of natural species unclear, many of the named species being clonally-propagated hybrids; there is genetic evidence that even the wild, true-breeding species are of hybrid origins. Remarkably, all cultivated Citrus may derive from as few as four ancestral species. Numerous natural and cultivated hybrids include commercially important fruits such as the orange, lemon, lime, grapefruit, and some tangerines. Recent research suggests that the closely related genus Fortunella, and perhaps also Poncirus and the Australian genera Microcitrus and Eremocitrus, should be subsumed in the genus Citrus (indeed, most botanists now do classify Microcitrus and Eremocitrus as part of Citrus). Here is a nice history of citrus, along with more growing tips. You don’t make "key lime pie" with limes from the Florida Keys: you make it with key limes, which are a citrus materially different from ordinary limes. It was last modified on Saturday, 9 February 2019, at 20:06 EST.